A picture is worth a thousand words. 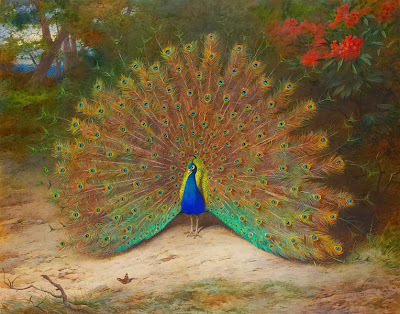 It wasn't until I saw the title of this painting on-line, (The Peacock AND the Peacock Butterfly) that I looked closely to find the dainty peacock butterfly. They appear to be sizing each other up, these two. The little butterfly peacock can fly, while the stunning big bird is mostly grounded. I think the angels were sending a message on paying attention to the details. See the entire picture, and don't get mesmerized by the brightest and biggest. All life is on a mission helping us to return our thoughts back to the Divine Mind. 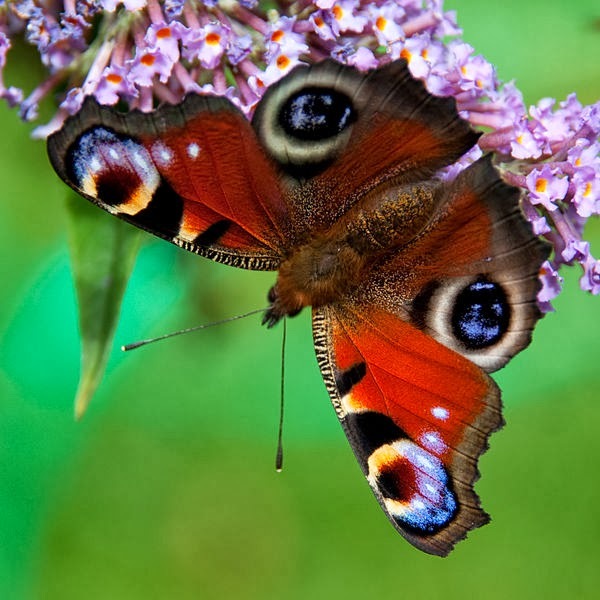 Butterflies are free and represent a new way of being. Many friends comment on the inner changes they feel during this time of major transformation. Like the butterfly, we, too, are becoming a new creature in Christ consciousness. It's exciting, but one must stay grounded as there is a tendency to be flighty, zoning in and out of time and space. A wonderful mantra to use when feeling less than grounded: "Be still and know that I am God." I speak it silently as a command to my body. A peacefulness settles over me as I let go, and let God take the reins. Enjoy your time with the Angels. And remember that every thing you say or do is important, so choose your actions with love.